It’s been a busy weekend, to say the least. It all started last Thursday with one of the best days I’ve experienced since moving to Oregon: Momiji’s all-you-can-eat sushi night. They were celebrating their one-year anniversary (I remember being just as excited when they posted their Grand Opening sign), and Rob and I definitely took advantage. For about $28 a person, we were able to order and eat as much sushi, sashimi, and cut-rolls as we wished. Sounds like a great deal, right? Well, by itself, $28 worth of sushi is still a whole lot of sushi to eat, and we started realizing this as our bellies quickly expanded. But did that stop us? Heck no! It’s all-you-can-eat sushi, baby! An hour and $126 worth of sushi later, we rolled ourselves out the door, drove home in a foggy state of fullness, and plopped on the couch to let digestion do its thing. While, Rob can avidly tell you, I was a kid in a candy store in the restaurant, it’s going to be a long time before I eat hundreds of dollars worth of sushi again (by a long time, I mean, like, maybe a week). As Good Friday called for its traditional Fillet O’ Fish (and late-night helping of moose tacos – not so traditional), and the weekend rolled around, I was given another opportunity to indulge in fantastic food. After all, it was Easter weekend. Growing up, Easter was always a big deal in our house. My sister and I searched the house for hidden eggs, only just a few years past the point of being “too old,” and my mom would always give us a Cadbury Cream Egg, even though she couldn’t stand the sight of them (it looks like a chocolate covered raw egg!). So this year, while I knew we wouldn’t be searching for eggs, I thought we could still celebrate the season with great food. There are certain times when I’m in the kitchen, or when watching one of the many cooking competition shows on TV, and think nothing bad better happen right now. It’s usually during crucial moments of poaching or toasting or can’t-walk-away-from whisking. Usually, nothing bad happens. Usually. When I woke up, I didn’t feel quite right. The weather had graciously changed for the better, and I was still a bit sinusy from the past week’s cold. 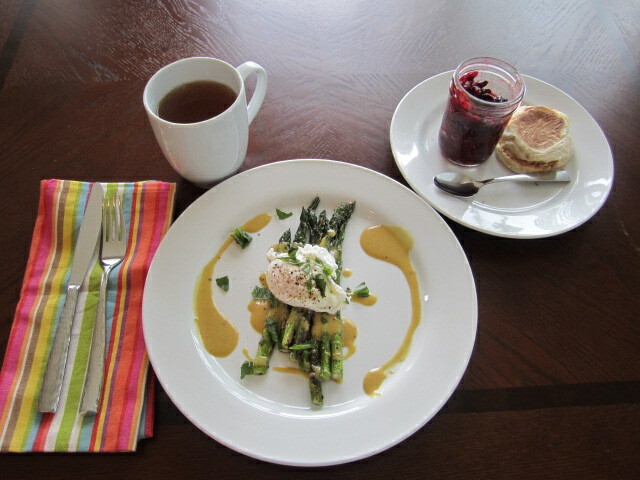 As I was making breakfast – one of my favorites: poached egg on top of mustardy roasted asparagus with English Muffins – I decided to take a moment to relieve some of the pressure in my sinuses by blowing my nose. So, with water starting to boil, asparagus almost finished roasting, and the English Muffin nestled warmly in the toaster, I quickly ran to the bathroom. What followed was the definite oh-bleep moment I had in past times wondered about. A bad thing had happened at the wrong time in the kitchen. To spare any of my more queasy readers (and, this is a food blog after all), I’ll skip the gory details just to say that I had a nose-bleed of epic proportions. Simply, it was gross. Also a mess. And as I’m standing over the sink trying not to faint from rapid blood loss, the very familiar ring of the smoke alarm sounds, reminding me that 1) I have very specifically-timed food cooking, and 2) I’m about to burn the house down. Again. So with tissue rammed against my face, I ran to yank the over-heating toaster cord out of the wall, push some button on my range hoping it turned off the oven, killed the flame on the stove, and started wildly flapping a towel around the air near the alarm, trying to herd the smoke towards the open back door. Finally, silence. With a physical and audible sigh, I made my way over to the kitchen to survey the damage. The only burned items were some small asparagus spears and a beyond-crisp English Muffin. 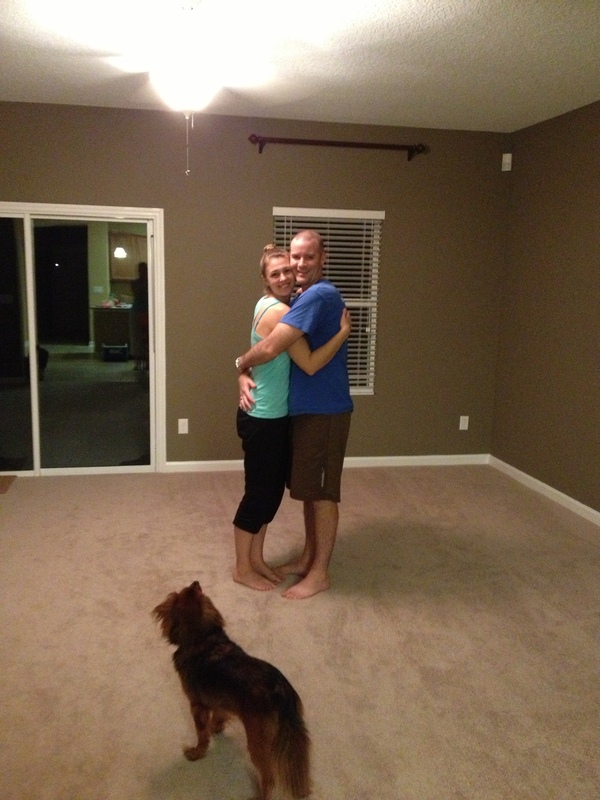 At which point a second realization kicked in – oh yeah, my nose was still gushing. After a rest on the couch, and waiting for platelets to do their clotting thing, I tried breakfast again. This time with success. 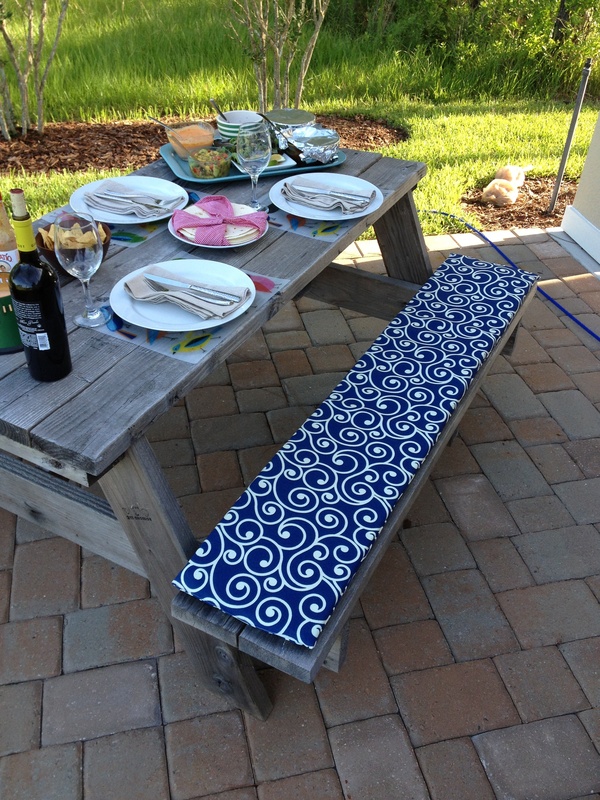 Easter diner was much less dramatic, and much more comfortable. But it did test my skills in the kitchen. 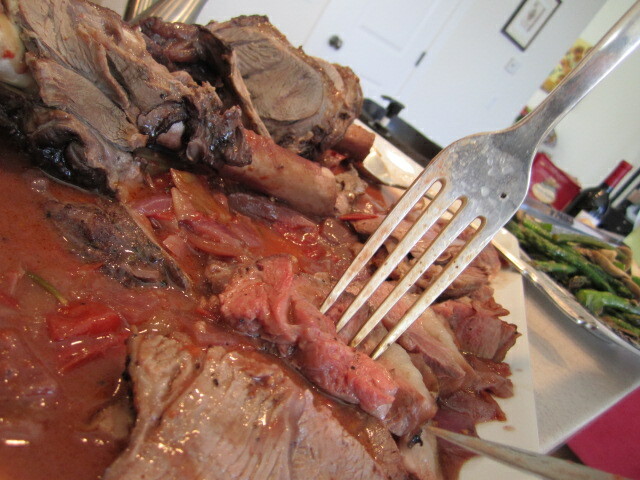 We had Lamb Two Ways: shanks braised in red wine, and a leg roasted with herbs. Simple spring veg of green beans, asparagus and mushrooms in a simple white wine and butter sauce accompanied just perfectly, with a sweet potato and thyme soufflé to round out the meal. Dessert was also a hit (that is, after a boil-over of butter and milk) consisting of Almond and Cardamom Rice Pudding with Rhubarb Compote. 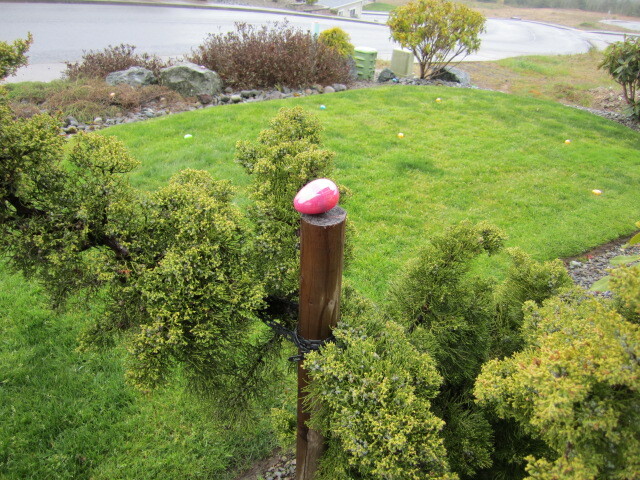 With enough Easter candy to go round, our friends, their 2-year old son, Rob and I had a great time. In taste-testing the two techniques used on the lamb, we preferred the texture of the Roast better, but both had amazing flavor. 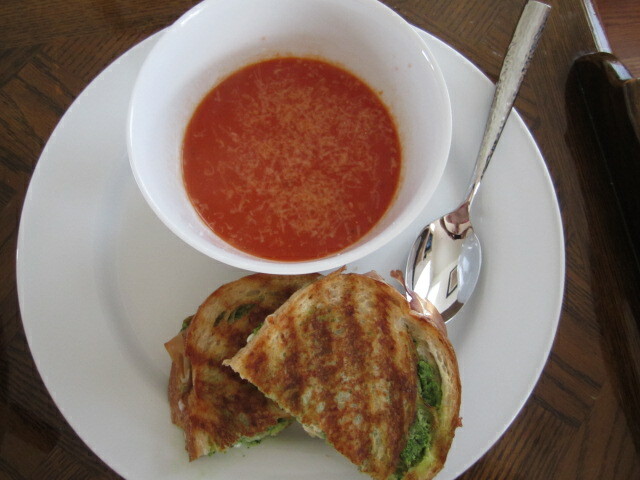 So, after an exciting weekend, last night was easy: Broccoli Pesto Grilled Cheese Sandwiches with homemade Tomato Soup. It was fast, easy, comforting and yummy, so I’ll include it here for you to enjoy. But while cooking, please don’t hope for something bad NOT to happen – you just might jinx yourself and end up with a bloody nose! Enjoy! To make the pesto, boil water in a small pot and drop in the broccoli florets. After about 1 minute, strain the broccoli and “shock” them in ice-cold water (this is called blanching – it keeps the bright green color of the veg). After completely cooled, dry the broccoli as best you can, and add it, plus the basil leaves, garlic, and a pinch of s&p to a food processor. Add some olive oil to get the blade moving, but then slowly pour in the rest of the oil while processing, until the mixture resembles a paste. 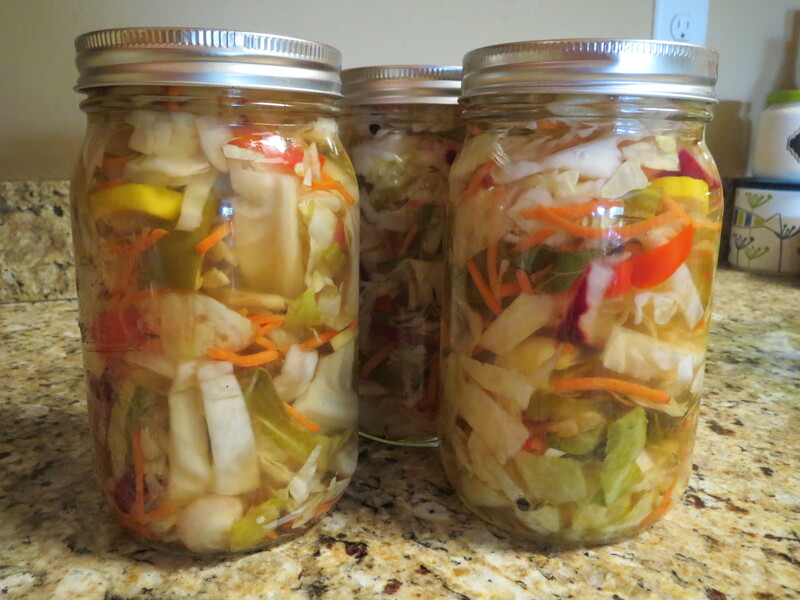 Taste for seasoning, and either use immediately, or store in fridge for 2-3 days. 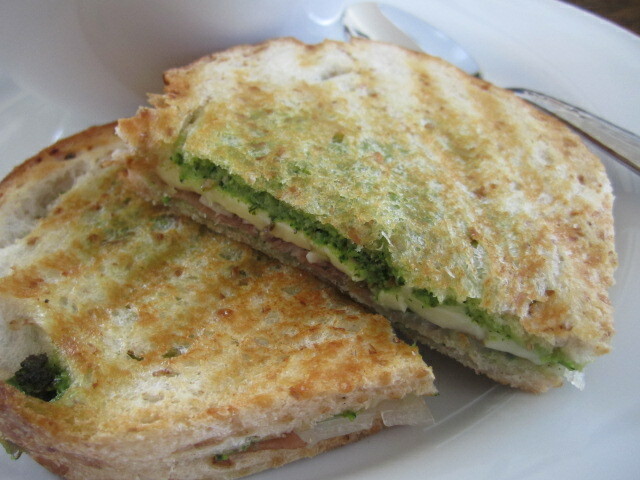 To make the sandwiches, spread a layer of broccoli pesto on each slice of the bread. Add the cheese and slice of prosciutto, and top the sandwich with the other slice of bread. Butter the top of the sandwich before putting on the grill. Place the sandwich on a hot grill pan, butter side down, with a weight on top (another heavy pan or heat-proof dish). After browned on the bottom, butter the other side, and flip, and weigh down again. After both sides are golden, cut and serve with Tomato Soup. Note: this is a very bright, tomato-y soup. If you enjoy a richer soup, roast the tomatoes for about 20-30 minutes at 400 degrees beforehand, and add cream after blending the soup. grated parmesan cheese for garnish, optional. In a large pot, saute the onions in the olive oil with a touch of salt and pepper. Once translucent, add the garlic, and stir (do not let the garlic burn). 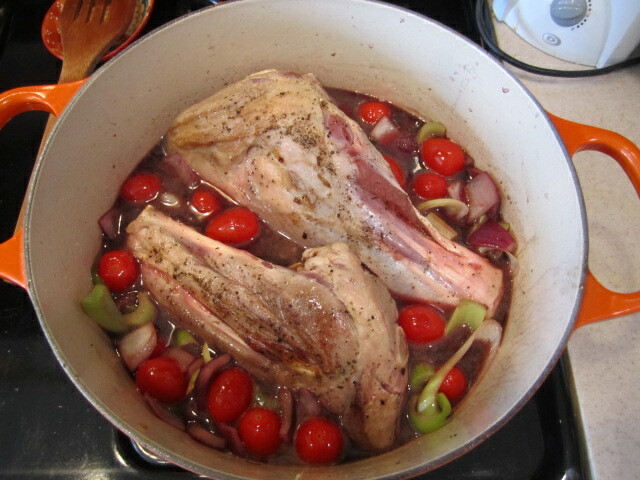 To deglaze the pot, add the white wine, and then add the tomatoes. Turn the heat to medium, and cover, until tomatoes have popped and given off a significant amount of their juices in the pot. 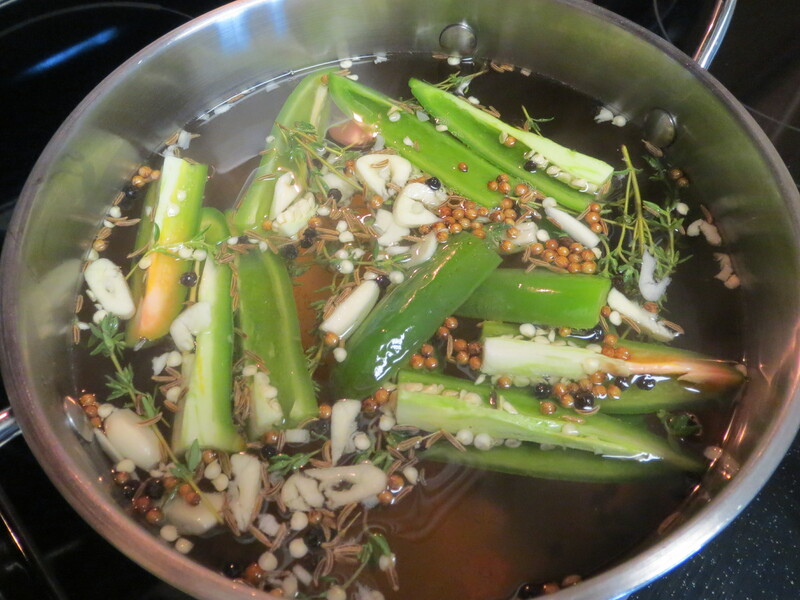 Add the herbs and the chicken stock and bring to a boil. Then, turn down heat and simmer for 5-10 minutes. To blend the soup, either use an immersion blender, or process in a blender in batches. Once blended, simmer for another 5-10 minutes, and serve. … To cafeteria food. Let me explain. Most education specialists – speech therapists, Title 1 teachers, counselors, or otherwise, don’t always receive a typical sized classroom for their groups. I’ve heard horror stores about speech therapists having to meet in conference rooms or broom closets due to lack of space and lack of funding to provide space. Being a Title 1 subject specialist, I, as well as the ELL teacher and the counselor, have a small room located off the gym/cafeteria. It works well for small groups, and I did my best to turn the gray brick walls into a place of learning, and the kids seem to really enjoy coming to my room – even if it’s just to hang out and say “hi” before the morning bell rings. Due to the nature of my job, I have very fluid groups of kids that come see me for math intervention. Then, based upon formal and informal assessment data, they either continue with the intervention, or “graduate” from my group. The beginning of the year had a lot of movement, trying to figure out which kids in the school really needed the assistance, and who simply had a poor initial testing day. But after the few beginning switches, I had a solid groups of kids ready and eager to improve in math. One of my favorite things about being a teacher is how each class kind of forms their own personality. They work together (for the most part), learn from each other, and generally mesh in a way that uniquely works for them. No two classes are ever the same. And at the end of the year, it’s always a little sad to see the class bolt out of the door, breaking that organic cohesive bond with each exuberant leap across the playground toward the summer ahead. This year, being in this specific position, my classes are expected to change throughout the year. We recently finished another round of formal testing, and yesterday my classes did change – drastically. All weekend, I had this nagging familiar gut feeling that Monday was going to be like the last day of school, and the first day of school, all wrapped up into consecutive 45 minute periods throughout the day. And my feeling was correct. I was sad to see my classes change, the personalities of our groups evolving, but simultaneously extremely happy at the kids’ progress, and also nervous about the new dynamics of the brand new faces anticipating me as much as I was anticipating them. Almost everyday I bring leftovers from the previous night’s dinner for lunch. Bringing in things like Roasted Beet and Pear Salad with Spicy Pine Nut Butter dressing definitely draws some looks in the Teachers’ Lounge, especially next to the classic PB&J sandwich. But yesterday’s lunch was especially good. 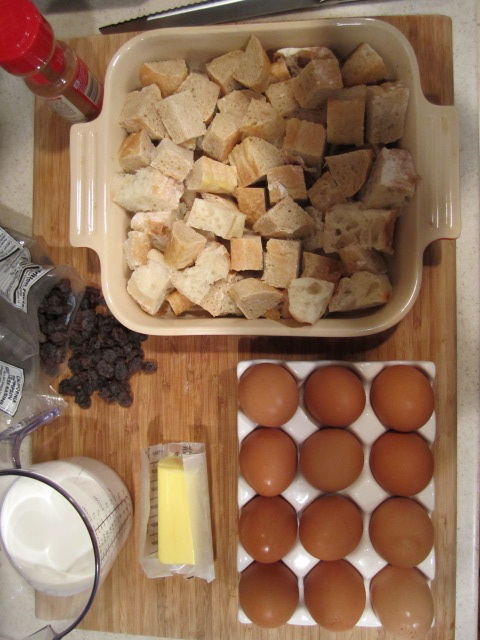 Sunday night, Rob was on duty and I had already brought over a Goat Cheese, Hazelnut, and Barley Salad for lunch, and a Cinnamon Raisin Bread Pudding for the next day’s breakfast. We wanted something easy, yet stylish for his Sunday night working dinner, so I whipped up a chipotle frittata, served withOregon Pepper Jack cheese, greens, and a lime-cilantro dressing all layered between toasted 9-grain bread. Holy cow – It. Was. Awesome. Knowing I needed a lunch for Monday, I saved half of my sandwich, already looking forward to having a treat during my lunch break. But before I even got close to diving into my Mexi-Italian inspired meal, the cafeteria got me. Dragged me in. Left me with no mercy. Made me scream “uncle.” Ok, I’m being dramatic again, but it was my all-time favorite comfort delight: Thanksgiving food. I was more than happy with the lunch I had brought from home, but the simple familiarity of the Thanksgiving lunch was the perfect buffer to a day with so much change and uncertainty. Needless to say, as I scarfed down the buttery mashed potatoes, and tore apart the turkey breast (so tender the plastic cafeteria fork more than sufficed), and practiced a good deal of adult self-restraint not the lick the last bit of gravy from the plate, my gourmet Chipotle Frittata Sandwich took a back seat. 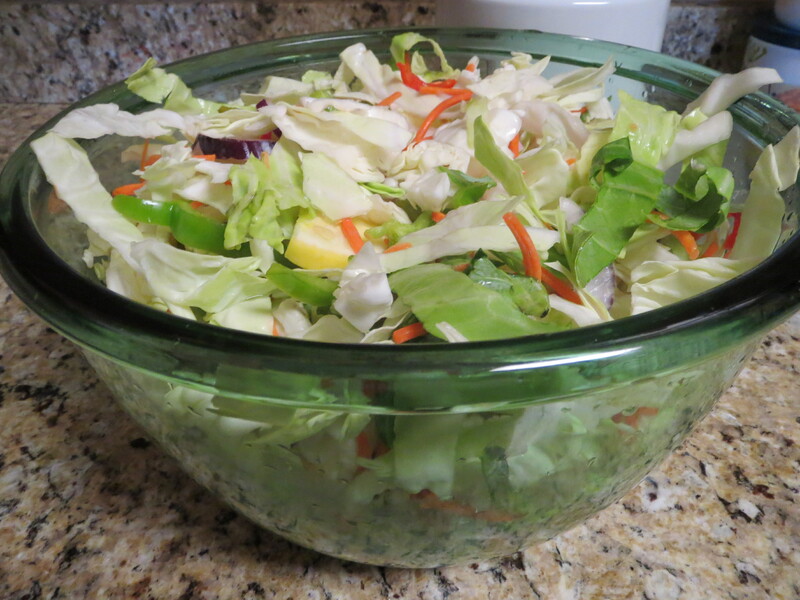 Staying true to my New Years Resolution, I balanced my unexpected lunchtime caloric intake with a 2 mile run/5 mile walk and a lovely Green Goddess Salad for dinner. But despite the extra reason to exercise, that lunchtime treat just made yesterday even more special. Sadly, I said goodbye to many students and gladly accepted their group hugs. Happily, I played 20 questions with new students, giving them the chance to break the ice and get to know me before I teach them the “tricks” of math. I’m challenged by the opportunity to help a new group of K-4 students improve in a subject they understandably don’t like, and it’s a blessing to do so. In hindsight (which is usually the best-sight), there was no real reason to stress about the change – it’s just a part of the job, and it’s a change that is so rewarding. Today, almost every one of my former students came by to see me – it was so sweet. And it made me realize what an important day yesterday really was. (I also learned how to put money into my teacher’s lunch account, so now, the next time the Thanksgiving lunch rolls around, I’ll be ready to indulge!). 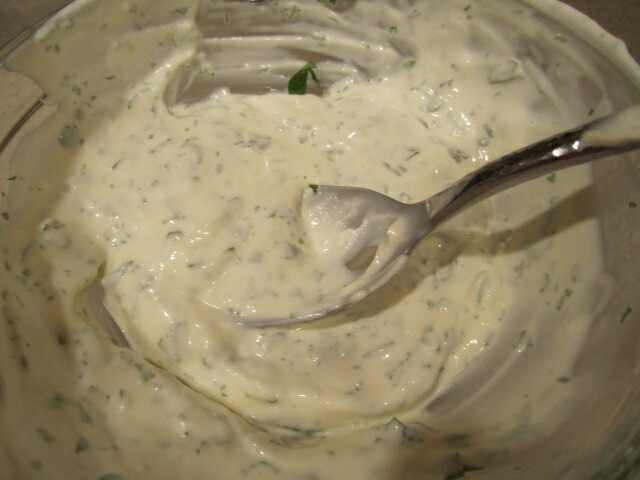 Mix the mayonnaise, cilantro, and lime juice together to create the dressing/spread. Taste for s&p seasoning (careful, mayo can be pretty salty on its own), and set aside. Heat the grapeseed oil in a small (French omelet size) non-stick pan on medium heat. Whisk the eggs, egg whites, and half & half together, and add the diced chipotle peppers. Add mixture to the pan, and let sit for a bit to cook the bottom. With a spatula, gently pull the sides away from the pan, tipping the pan so some of the raw egg falls under the cooked area. When only a small amount of raw egg is on the top of the frittata, put a plate (or accompanying pan lid) on the top of the pan, flip the pan so the frittata falls onto the plate/lid. 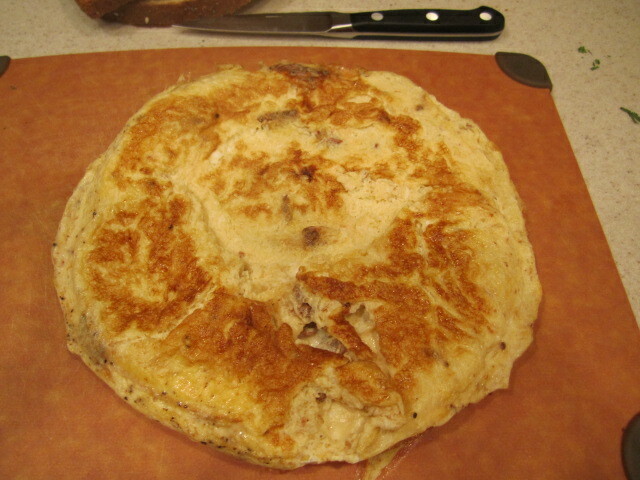 Then immediately transfer the flipped frittata back to the pan to cook for a minute more (or, if you are really fancy, just flip the pan saute-style so the frittata has an airborne moment, flips 180 degrees and lands perfectly back in the pan. Say “Ta-Da!” afterwards. But I recommend doing this over the sink the first few times, to avoid a grumbling significant other cleaning up half-cooked egg on the stove). NOTE: you can also cook a frittata in the oven at 375, just keep an eye on it as it can go from raw to brown very quickly. Meanwhile, toast the bread slices. When frittata is done, transfer to a plate and slice in half. 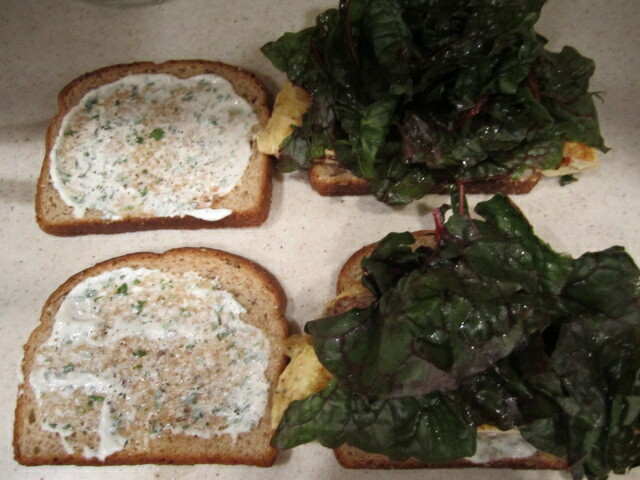 Layer the mayo dressing, the frittata, the cheese, and the swiss chard into a sandwich. Slice and serve.